Nathaniel G. and Koko, who live at St. Mary’s Home, showed off the transformed courtyard near St. Mary’s entrance to Garden Club of Virginia President Kim Nash (standing, in red) and members of Norfolk’s Harborfront Garden Club. Also joining the group were Suzanne Eason, St. Mary’s supervisor of occupational therapy support services, standing at far left, and Ron Herrick, who leads St. Mary’s environmental services department, which has worked on the courtyard along with garden club members. 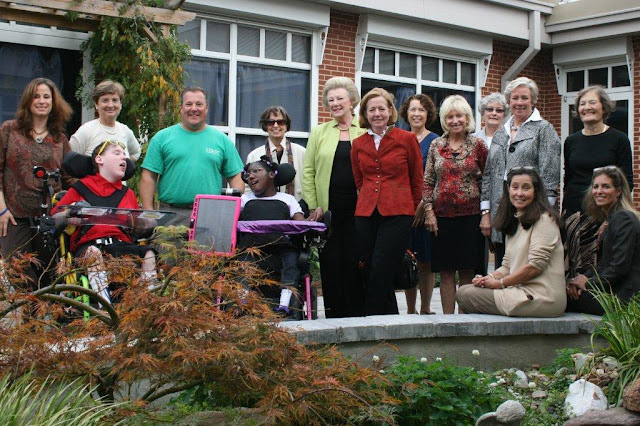 KimNash, president of the Garden Club of Virginia, visited St. Mary’s Home today to see how Norfolk’s award-winning HarborfrontGarden Club has transformed a courtyard for the children and young adults toenjoy. Nash toured the Home and the courtyard and met with some of the children — Koko and Nathaniel G. — and staff. A $10,500 grant from the Garden Club of Virginiarecently enabled the Harborfront Garden Club to complete the courtyard afterseveral years of work. Thecourtyard, near St. Mary’s main entrance, had been mostly filled with grass. In2007, the Harborfront Garden Club began working with Girl Scout Troop 5067 toturn the courtyard into a Butterfly and Sensory Garden. Gardenclub members planted plants and bulbs they dug up from their own gardens, aswell as plants donated by a nursery and $500 in plants the club won in anational website contest. They also raised funds for the project by selling a cookbook. Asthe plants flourished, the club funded the installation of a major feature inthe courtyard: a 500-gallon fish pond, which members of St. Mary’s environmentalservices department built in 2009. Thecourtyard is surrounded by large windows, so the children, their families,visitors and staff can enjoy views of the garden from inside. Going into thegarden, though, wasn’t that easy for the children and young adults, who usewheelchairs. Then,last year, the Harborfront Garden Club won the Common Wealth Award, which providesgrants to community projects of the Garden Club of Virginia’s member clubs. Thelocal club used the $10,500 stipend to buy more plants and to install paved,wheelchair-accessible pathways this summer. To see more photos of the courtyard, including views from the rooftop, see St. Mary’s Facebook page.